Significant, and largely-unnoticed, changes, with long-term consequences, were being made in U.S. military commitments in the Middle East as the U.S. political system was preoccupied with the Nov. 8, election process. Outgoing President Barack Obama had initiated processes to attempt to commit the U.S. to comprehensive military engagement in Syria and in Yemen, in support of Turkey, Qatar, and Saudi Arabia, despite the fact that, in particular, the Turkish government was moving into a position of direct hostility toward U.S., NATO, and European interests. Igor Konashenkov delivered a warning to the U.S. alliance. U.S. Secretary of Defense Ashton Carter had, on Oct. 22, met with Turkish officials to negotiate a Turkish military involvement inside Iraq, to support the liberation of Mosul from DI’ISH (asad-Dawlah al-Islamiyah fi al-‘Iraq wash-Sham) occupying forces. Iraqi Prime Minister Haider al-Abadi immediately rejected the move to insert the Turkish forces, which was clearly a move by Turkey to replace and perhaps oppose Turkish Kurdish forces, particularly the Peshmerga fighters, engaged in the war against DI’ISH. Turkey sees these and other Kurdish forces as its primary adversary, and its movement of troops into neighboring Syria — again, ostensibly to fight DI’ISH — has also been primarily to fight Kurdish and Syrian government forces. Prime Minister al-Abadi noted, with some restraint, that Iraqi, Kurdish and other local forces would handle the battle for Mosul, but the reality was that Ash Carter’s move on behalf of Turkey — the government of which now sees the U.S. as its principal adversary — further worsened the rift emerging between the Iraqi and U.S. governments. The rift between the Iraqi and Turkish governments, too, is now significant. Within Syria, the U.S. has pushed its combat air assets into closer and closer risk of direct confrontation with both Syrian Government and Russian forces, deliberately courting a reaction from them, which would then act as a casus belli for direct U.S. military involvement in the war in Syria, a move which would automatically provide full license for Turkey’s already expanding ground force engagement in Syria. U.S. Secretary of Defense Carter had told NATO officials on Oct. 8, that Russia would soon pay a price for escalating the conflict in Syria, against the rebel forces there, including DI’ISH. The Russian Government had said, on Oct. 6, that it would shoot down any U.S. military aircraft which attacked or threatened Russian forces in Syria. 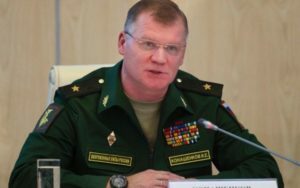 Igor Konashenkov, the Russian Ministry of Defense spokesman, noted: “I draw attention of ‘hotheads’ that after a strike on Syrian troops in Deir ez-Sor by planes of the coalition on Sept. 17 , we have taken all necessary measures to rule out any such ‘mistakes’ against Russian military and military facilities in Syria”, a clear reference to the deployment of the Russian S-300VM Antey-2500 anti-air missile systems to Syria. The Obama White House has a longstanding commitment to support its Sunni partners in the region (Turkey, Saudi Arabia, and Qatar), who are anxious to replace a nominally Shi’a (‘Alawite) leader in Damascus, and remove all non-Sunnis from Syria. The U.S. Defense Dept. concern, however, is more strategic: it sees Russia now filling the great power vacuum in the Middle East. Thus, the Pentagon now supports direct engagement. Similarly, Obama White House commitments to Saudi Arabia have led the U.S. into increasing military engagement in the Saudi-led (and so far highly unsuccessful) war in Yemen against Zaidi Shi’a and allied forces. In addition to intelligence and some air assets, the U.S. Navy on Oct. 15, began escalating attacks against Zaidi Shi’a (Houthi-led) radar installations in Yemen after two unconfirmed, alleged attempts by shore forces to fire anti-ship missiles at U.S. Navy vessels. The Arleigh Burke-class heavy destroyer, USS Mason (DDG-87) on Oct. 15, fired off countermeasures (no incoming missile hit was actually recorded), and then three Tomahawk land-attack cruise missiles were fired against the Houthi shore sites by the USS Nitze. There is some question as to whether this provocation — like the Ghouta chemical device incident in Syria on Aug. 21, 2013 — was in fact undertaken by Saudi forces to “legitimize” a U.S. military engagement in Yemen. But what is clear is the fact that the Obama White House seems determined to ensure that the U.S. was actively engaged in a conventional military commitment in Syria and Yemen before President Obama left office, regardless of the consequences left for the incoming U.S. administration.